Courtesy College of Arts and Sciences. 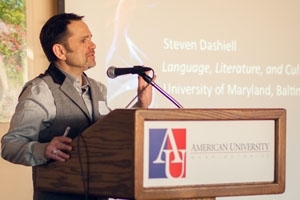 Celebrating its 23rd year at American University in Washington, D.C., Lavender Languages is North America’s longest-running academic conference on language use in lesbian, gay, bisexual, transgender and queer life. The conference focuses on linguistic practices, and this year also attends to the growing tensions between (homo)sexuality and citizenship in U.S. settings and worldwide. “The conference draws senior scholars and undergraduates, community members and political activists because of their shared interests in LGBTQ language. As this year’s program demonstrates, those interests now span the globe,” said William Leap, the conference founder and professor in AU’s Department of Anthropology. Scholars attending this year’s conference hail from countries such as Scotland, Ireland, Colombia, Ecuador, Costa Rica, France, and South Africa. A panel on language, sexuality and national belonging will explore ways in which the relationships between national belonging and sexual subjectivity are mediated through linguistic practice. In many contemporary societies, one must identity and present as heterosexual in order to be recognized as a full member of the nation, which in many cases results in conflicted relationships between LGBT citizens and the state. • David Peterson will host a back-to-basics workshop on Critical Discourse Analysis. Peterson’s popular course provides useful skills for language analysis in any setting. • Salvador Vidal-Ortiz and Leti Gomez will introduce, discuss and take questions from the audience about their new book Queer Brown Voices (University of Texas Press, 2015). This stunning collection of papers about LGBTQ Latino/a activism has gained much praise from critics. Gomez and Vidal-Ortiz will talk about the political and linguistic dimensions of this project. • Research Panel: The panel features projects located in the United States, Ireland, and Argentina. Session presenters will discuss how they use language as an entry point for exploring social voice and recovering social history and take questions about research design, procedure and practice. • Two sessions will explore how gender and sexuality influence language learning and language teaching in everyday life and in the classroom. These Saturday morning sessions will be of particular interest to teachers. The conference runs this year from Feb. 12–14. While it is an academic conference, all sessions take an informal approach, and members of the public are always welcome to attend. Information on the conference can be found by visiting the Lavender Languages website.